With the Wrought Iron & Cedar Fly-Thru bird feeder from Bird's Choice you can accommodate a wide variety of species and their respective feeding preferences. It's almost like a little town square for birds to mingle! Wide construction gives plenty of room for sharing, and durable iron and cedar construction mean your feeder can stand up to the wear and tear of any weather climate. Its easy-to-clean seed tray can also hold fruit and nuts, making it easy to attract many different kinds of birds. Its sturdy roof also protects your food and the birds from rain and snow. * Please note: This item does not come with the mounting flange. To order the Birds Choice mounting flange, go to catalog number 185132. ***Note for measuring: The width is for the max, which is the roof at 23". The height is the mas, which is from the peak of the roof to the bottom of the base a little over 13"
Love this fly through feeder! The birds love it also! This is our first fly-thru feeder and we love it. It is very well built, looks nice, and for once it's great to be able to see and enjoy ALL the birds that come to the feeder; not just the ones who landed on the side we could see. I have no regrets in purchasing this feeder and if you're new to fly-thru feeders, this one is well worth it. 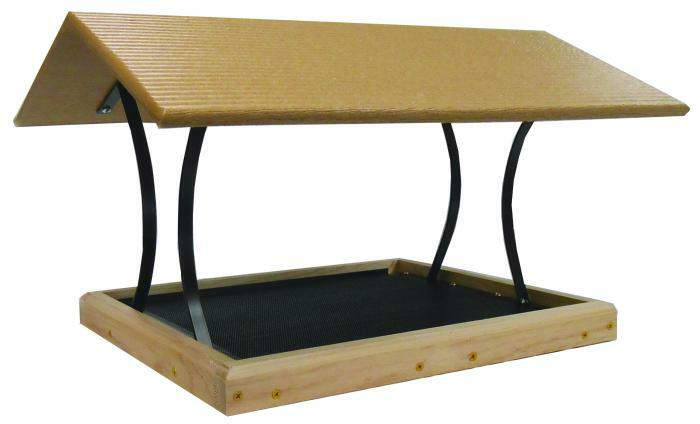 I've been looking for a large platform feeder for some time and this one fills the bill. The high roof makes the feeder open and airy. We recently had 16 inches of snow and the roof did a great job of keeping the seed protected. It's well-made and is quite attractive. It is a bird magnet. I love it as much as the birds and squirrels do. It's been very entertaining. Feeder is well made. It's big enough for 6-8 big birds, like doves and bluejays and will hold many more little birds. Thank you Backyard Chirper. The feeder is larger than most, is very sturdy, withstands the harsh Texas summers, and is very easy to clean. Many birds at a time can use. I love these feeders. They are the best I have ever found and I have been feeding wild birds for about 20 years now. I had already reviewed this item but I do not mind repeating the fact that this is an excellent bird feeder. 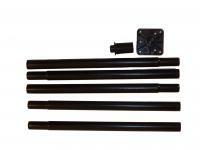 Quality of materials are outstanding and the prompt delivery was exceptional. Most importantly the birds LOVE it. Our favorite bird feeder of all time. This was simple to assemble, the birds love and I was impressed at the heavy weight of it. It's very sturdy. Love that the roof is slightly larger that the base to really keep the seed dry even in breezy rain. Exactly what I wanted, a well made bird feeder, the birds and the squirrels love it. I actually got it for squirrels and they love it. I put fruit and nut mixture in it. Birds come to it too. It was very easy to put on a pole with the bracket that I got. Very good construction. I've been looking--forever--for a feeder big enough for our Western Grey Squirrels to get in and have finally succeeded with this feeder. As a bonus, birds--jays, pigeons,chickadees and others---are able to feed from the edges of the feeder while there's a squirrel in it, and my never-ending battle trying to keep the squirrels from the bird feeders has finally come to an end. I couldn't be happier! 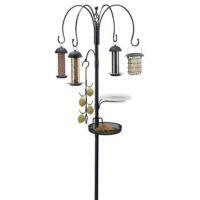 The birds and I love this good looking and sturdy bird feeder. I have more birds than I ever imagined and the feeder keeps out the weather and cuts down on wasting of seed. Thank you for this great product. Beautiful feeder that my birds love. Super service! Received feeder 2 days (standard shipping) after I placed order! And the price was $30 below competitors! I'm a happy birder! I love this feeder, it was just want I wanted, simple lines and nice size. This is a great feeder. We live in the mountains where snow is prevalent all winter so the roof on this feeder is very helpful. At first the Stellar Jays had issues flying in, but have adjusted and feed regularly. What I appreciate is the larger birds, crows/ravens/pigeons, do not visit and drive away the other birds. Opt for this larger feeder as the height of the roof is very accommodating. Excellent customer service with questions about securing this feeder onto pole system by another company. Thanks! Great feeder with lots of open area to watch birds feed. Easy to maintain and a good value. You can't go wrong with this. Easy assembly with right power tool. Attractive, sturdy bird feeder that assembled easily. The removable, perforated metal tray is a very nice feature. It's description is accurate enough and the assembly was fairly easy, but it's just too small. I have built two platform feeders using a typical small window screen approximately 18"x24". They didn't have a roof, but it was large enough to accommodate large and small birds at one time. Dove size on down. Yours does look nicer in the yard, so I guess it depends on what you want. My homemade one isn't very pretty, but it has been in use for about 15 years, year round.